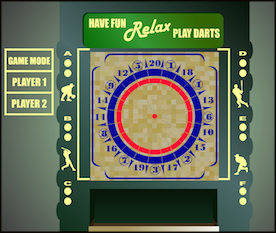 Like many games, darts comes with some language of its own. There are different names for different scores and events. This is by no means a full listing of every dart term, and I'm sure some of the terms are local, and vary from town to town. Blackout - an inning with zero points. Ginsberg - is also an inning with 9 points. Snowman - is another term for an inning with 8 points. The Gun as in "give him the gun" is an inning with 7 points. Named after the hand signal for a 7 point inning. Angel Dart - a final dart in the trip, after having missed points with the first two darts in the inning. In some circles this is referred to as a Zippy Dart in honor of a player who makes use of this tactic regularly. Three in a Pond - three darts that all hit the singles section of the inning.